New trailers are making the circuit this week and this particular one is for the new TV series from CBS, starring Melissa Benoist, in Supergirl. Every time I see clips or trailers for CBS's Supergirl, it rubs me the wrong way. She's giddy and seemingly insecure. And if this is how they are going to permanently portray this character, that's a shame and an insult to the gender as a whole. But we may get surprised yet and see a decent story come out of this. I mean this is CBS. Supposedly Superman will be referenced, but we won't be seeing him and as reported recently, the idea of a crossover between Supergirl with Arrow and/or Flash is not in the works yet. But since CBS is the parent of the CW, it won't be a stretch. My guess is they are waiting to see how it does. They screened the first episode at Comic-Con and it was well received. But that is a spiked environment where everyone is high on having fun and everything seems exciting. The show premieres on CBS on Mon, Oct. 2. In the vast DC Comics Universe of super heroes, the rich mythology of Superman, the planet Krypton and the House of El is perhaps the most famous and instantly recognizable. 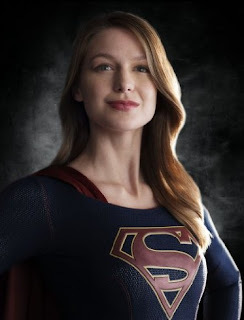 Enter Supergirl (Melissa Benoist). Born Kara Zor-El on the doomed planet Krypton, the preteen Kara escaped at the same time as the infant Kal-El, but didn't arrive on Earth until many years later after being lost in the Phantom Zone. Protected and raised by her adopted family, the Danvers, Kara grew up in the shadow of her foster sister, Alex, and learned to hide the phenomenal powers she shares with her famous cousin. Years later, at age 24, living in National City and working as an assistant for Catco Worldwide Media mogul Cat Grant (Calista Flockhart), Kara has spent so many years trying to fit in that she forgot to ever stand out. All that changes when she decides to embrace her superhuman abilities and become the hero she was always destined to be.